Limited Time: Try a GX-7 Today and Get Free U.S. Shipping! Longer, straighter tee shots, or your money back. Watch the video below to see how the GX-7 “X-Metal” delivers more control and more accuracy with fewer miss-hits and more fairways than the typical driver. The lessons didn’t help much, did they? Neither did tweaking your grip or revamping your backswing. And that golf-fitness regimen? Hey, at least you gave it a try. Now here you are, all that time and effort and money gone down the drain, wondering why the heck your tee shots are still short and crooked. You’ve been trying to make your swing work with your driver. When what you need is a driver that works with your swing. Sorry, we would’ve told you sooner – if such a club had actually existed. And man, are we itching to tell you about it. But we sense you wanting to interject. What’s on your mind? “Let’s back up a minute,” you’re thinking. Do you really think pros play drivers designed for amateurs? Of course they don't. In that case... Why should amateurs play drivers designed for pros? That’s exactly what you’re doing. And it’s killing your game. With a clubhead speed of less than 100 MPH, you just don’t have the juice to handle a driver made for guys who swing at 113 MPH – the PGA Tour average. It’s enough to make some golfers quit the game. Your struggles will soon be history. Thanks to a single golf club. Dennis Paulson & Carl Paulson, radio hosts and Tour commentators. Dennis and Carl are paid spokesmen for the GX-7 X-Metal. This is truly exciting stuff. So exciting, in fact, we forgot to introduce ourselves. We’re Dennis and Carl Paulson – no relation, but co-hosts of SiriusXM Radio’s “Inside the Ropes” program and commentators on the network’s PGA Tour broadcasts. We’re both former pros, too. Dennis won the 2000 Buick Classic, beating David Duval in a playoff, while Carl claimed two victories on the circuit formerly known as the Nike Tour. The GX-7 will take your game to new heights... and lengths. The GX-7 delivers the distance of a high-performance driver and the accuracy of a fairway wood, using your natural 7-iron swing. We know, we know. Hard to believe one club can right so many wrongs and do so much for amateur golfers. Well, to be perfectly honest, traditional equipment has set the bar pretty low. It’s been holding you back. TrackMan—the world leader in golf data analysis—has collected mountains of statistics from both pros and ams. The average amateur gives up 30 yards off the tee. Yes, 30 yards – the difference between hitting a wedge to the green or a 7-iron. That sink in yet? OK, on we go. Using stats from more than 10,000 golfers at all skill levels, TrackMan determined that the typical golfer loses 30 yards due to factors such as too little ball speed and too much backspin. These seemingly small ingredients knock off a ridiculous 24 yards of carry and 5-6 yards of roll per drive. The GX-7 is specifically designed to improve launch conditions – and provide consistent distance – for the average golfer. We’d be willing to bet that most of the 10,000+ golfers tested by TrackMan share something in common: They play drivers mass-produced by golf’s dominant brands. Four companies account for about 75% of all drivers sold. As for the other 25%, most are made with the same formula as the Big 4’s. Nearly all amateurs play drivers that are engineered for Tour pros. Drivers made for guys who never miss the sweet spot and value workability over forgiveness. Drivers with insufficient loft for the average amateur... with mass centered too high in the clubhead and too close to the face... and shafts that are too long and don’t always pair well with the clubhead. The GX-7, on the other hand, was created to work with your swing. Let's take a closer look at what makes the GX-7 unique, starting with its specs. Loft: 14° … More than a standard driver, less than a typical 3-wood. That helps you get the ball up in the air AND reduces the likelihood (and severity) of a slice. Length: 43” … That’s in line with today’s standard 3-wood. But consider: Drivers were once 43”. Now they’re 45” – 46” because Big Equipment keeps “cheating” – jacking up their distance claims by lengthening the shaft. In reality, this makes it harder for most golfers to square the clubface, magnifying your tendency to slice and costing you yards. Is this just a driver crossed with a fairway wood and declared “revolutionary”? Nope. There’s a lot more to the GX-7 than that. This club is flat out loaded with game-improvement features. 2) Moves more mass to the perimeter, raising the GX-7’s moment of inertia (MOI) for archer-like accuracy – and outstanding forgiveness on miss-hits. Softly curved at the front and from heel to toe, the GX-7 literally glides across the surface when hit from the fairway or rough. No matter your angle of attack, you’ll experience no snagging…no digging…no bouncing. Here the sole is recessed ever so slightly, a huge help to golfers who “flip” the club through impact. Rather than the sole skipping off the turf, the bottom of the GX-7 stays above the ground plane – so you won’t lose clubhead speed or catch the ball thin. Your good swings will produce longer shots, too. Bonus: The no-friction zone prevents the GX-7 from hanging up in long grass, so trouble shots are a breeze. Let’s continue our tour with a look at the GX-7’s frame. It’s made from ultra-light yet incredibly strong stainless steel, which allowed the design team to strategically place more mass around the clubhead – maximizing MOI. The extra-thin clubface produces faster ball speeds by virtue of its high “characteristic time” (CT) or rebound effect. You’ll consistently hit the GX-7 longer and straighter than the clubs you’re using today. Just as you wouldn’t put a 4-cylinder in a Ferrari and expect world-class performance, you can’t stick any old shaft in a hot-rod like the GX-7. That’s why the design team spent so much time under the hood. Working with 25 different manufacturers, they developed a proprietary shaft – available in your choice of four flexes – that’s perfectly matched to the GX-7’s clubhead for maximum speed, plus optimum launch angle and spin. The heart of the GX-7 lies in its sole, but the whole club is loaded with ultra-forgiving, amateur-friendly features. Still want to know more about this amazing new club? No problem. We’ve got tons yet to share. Including reviews from golfers who have tried it. Who better to extol the GX-7’s benefits than the lucky “guinea pigs” who tested it against their very own clubs? 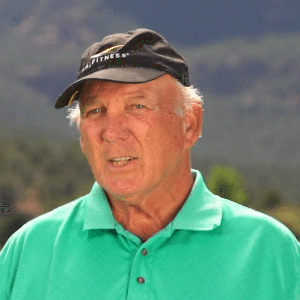 That was Jim Bedore, a 23-handicapper at 67 years old. No wonder Jim pines for the days of persimmon – he once carried a sub-12 handicap. Now that he’s discovered the GX-7, he may get there again. We’ll hear from Jim in a minute. On a sparkling October day at gorgeous Seven Canyons Resort in Sedona, Arizona, we randomly picked a half-dozen golfers to try the GX-7. Our testers’ handicaps ranged from 11 to 23, with swing speeds of 70 to 93 miles per hour. Each golfer hit a series of tee shots with his own driver, followed by a batch with the GX-7. They tried the GX-7 without a tee as well. Including carry distance, total distance and dispersion from the target line – on every shot. Would the GX-7, with its shorter shaft and extra loft, produce comparable distance to the golfers’ traditional drivers? With a smaller clubhead than today’s mass-market drivers, could the GX-7 match or exceed the competition’s accuracy? 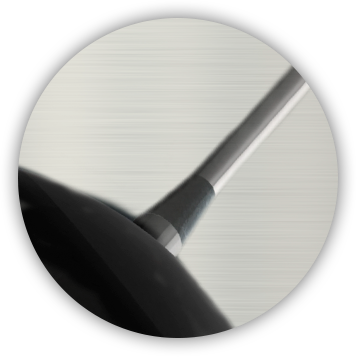 How quickly would the golfers adjust to hitting a club they’d never even seen, let alone swung? And could they really hit this thing off the deck? The GX-7 stood toe-to-toe with, and even out-performed, our testers "big name" drivers. The GX-7 was consistently long, too, faring especially well on off-center hits. Our No. 1 question had been answered in the affirmative. That was good. But the next finding was even better. To gauge accuracy, TrackMan measures how far each shot finishes from the target line. The GX-7 won hands-down, delivering some truly remarkable results. Tester Jimmy Buck nailed one tee ball 16 feet left of target; his next shot finished 8 feet right. The one after that was 1.3 feet from perfection. Not yards. Feet. Not to be outdone, Ron Graham roped a GX-7 drive within 4 inches of his line. Nate Bradley missed the target by a whopping 26 yards… total… over six shots. That’s an average “miss” of 4.3 yards. Dave Stuart couldn’t match those results, but he came close. He poked four drives an average of 5.3 yards offline. Most amazing of all, persimmon-loving Jim Bedore lasered a three-drive sequence within 1 foot, 2 feet and 6 feet of his aiming spot. Key stats: His average shot with the GX-7 finished 15 yards closer to the target line than attempts with his own driver – and with an average of 246 total yards, the GX-7 generated virtually the same distance. Key stats: Jimmy’s longest shot with the GX-7 traveled 230 yards, beating the longest with his own driver (226.8 yards). He also hit the GX-7 an impressive 219 yards off the turf. Key stats: The GX-7 beat his driver for average carry and total yards. Key stats: We told you about Jim’s crazy accuracy. Better yet, he didn’t sacrifice distance – Jim’s yardage with the GX-7 came within a couple club-lengths of his driver. These were some happy campers, alright. But we wanted to be absolutely sure the GX-7 was performing as well as our eyes – and the testers’ beaming faces – told us it was. 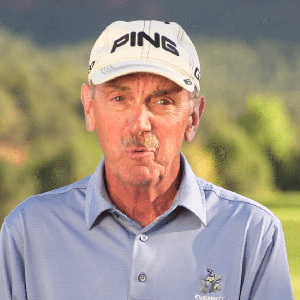 So we turned to TrackMan expert Rob Rashell – Director of Instruction at famed Desert Forest Golf Club and a former tour player himself – to interpret the numbers. TrackMan expert Rob Rashell on the GX-7. How could an unconventional, no-name club beat the game’s most popular drivers head-to-head? A.K.A. — You and all the other "regular" golfers out there. And we don't say "regular" in a bad way. We're just talking about golfers who play for fun and love of the game, not to pay their bills. The GX-7 was meticulously engineered to deliver high performance for recreational golfers with typical swing speeds and handicaps. Now here’s a little irony for you: The designers of the GX-7 weren’t some ragtag team of radicals working out of a dirty garage. Believe it or not, they built their careers (and reputations) crafting clubs for major brands. Who better to turn the status quo upside-down than two guys who know mainstream methods inside-out? Contractual matters preclude us from using the designers’ names, but we can give you a little more background. As we said, the pair made their bones working for “Big Equipment.” In fact, they’ve helmed some very high-profile projects. While we can’t name those either, we’ll tell you these guys have landed numerous clubs on Golf Digest’s prestigious Hot List – the industry equivalent to the Academy Awards. Remember that we told you most big OEMs build clubs for their Tour players? Yeah, these guys get it. So they know exactly how NOT to engineer a club to perform for "regular" golfers. Which seems like the perfect point to segue into a comparison that might help you understand, too. Bottom Line It’s designed for pros, it’s only good for one thing and it costs a small fortune… with no guarantee of satisfaction It’s designed for amateurs; it’s long, versatile, and insanely straight; it’s far more affordable than a conventional driver… and you’re guaranteed to love it. Still have questions about the GX-7? No problem. Peruse these FAQs. Q: Why call the GX-7 an X-Metal? Isn't it really just a driver? A: Hardly. The term “driver” doesn’t begin to do it justice. It’s true, the GX-7 is meant to replace your current driver. But this isn’t like, say, swapping one four-door sedan for another. It’s more like trading that sedan for a sporty coupe. … And numerous design innovations that make it unbelievably powerful, accurate, forgiving, consistent and easy to hit. With a little practice, there’s a good chance you’ll be able to hit it from the fairway. That’s right. Off the deck. Can you do that with your current driver? Didn’t think so. Q: If I switch from my driver to the GX-7, will I lose distance? A: Totally fair question. Short answer: No. Logic tells you that with its higher loft, smaller clubhead and shorter shaft, the GX-7 isn’t built for long-drive competitions. Instead, it’s designed to make you CONSISTENTLY LONGER. Meaning: Your average drive with the GX-7 will beat your average with a traditional driver. How can that be? It’s pretty simple, actually. The upshot: better distance and accuracy on miss-hits. You've seen the proof, too, in the results from our test golfers who pitted the GX-7 against their own drivers. Q: Crossing a driver with a fairway wood makes perfect sense. But how is the GX-7 similar to a 7-iron? A: Glad you asked. It’s all about the sole… and the center of gravity. Thanks to its unique design, the GX-7 works best when struck with a slightly descending blow, just like your irons and hybrids. It’s the opposite of how we’re taught to hit the driver. You realize what this means, right? With the GX-7, you can use the same swing for every club. No need to play the ball way forward in your stance when teeing off. No need to catch the ball on the upswing to produce maximum yards. No need to change your setup and thought process for 10-14 shots per round. No need for extra-long tees, either. 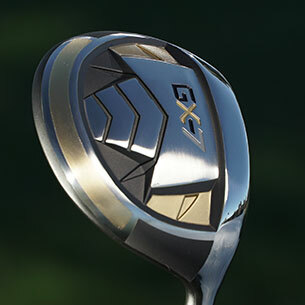 Just swing the GX-7 like a 7-iron – and smoke it like a driver. Q: How do I know if the GX-7 is right for me? A: Hmmm…is your swing speed at least 100 MPH? Do you average 250+ yards off the tee? When you slice, is it on purpose? If you’re shaking your head “no” and chuckling, you’re gonna love the GX-7. Q: Why should I choose the GX-7 over an adjustable driver and/or fairway wood? 1) Adjustable clubs aren’t 100% adjustable. Sure, you can change the loft, lie and face angle to meet your needs. But in many adjustable drivers, the CG (center of gravity) is high and near the clubface – good for pros, bad for amateurs. Even if you can move the CG, you usually can’t move it enough. Also, you could get stuck with a one-size-fits-all shaft length, typically 45” – 46” for today’s drivers. That’s too long for most of us. (FYI: The GX-7’s shaft is an easy-to-control 43”). 2) You’re wasting money on settings you’ll never use. 3) The GX-7 is essentially “pre-adjusted” to match the typical of golfer's swing. As we’ve already stated: If you can bomb your current driver 250-plus and slice-free, congratulations – you’re in select company. And the GX-7 isn’t for you. This club is designed for players who need help in the distance department, struggle with the ol’ “banana ball” and make inconsistent contact from both tee and fairway. Sound like anyone you know? On a related note, you may be considering a professional fitting for your next driver or fairway wood. That’s a great idea – assuming you don’t mind spending an extra $150 – $300 on top of what you pay for your new toy. Odds are, the fitter will recommend a club that closely matches the GX-7. Q: How can the GX-7 help with my slice? A: As you know, a slice is caused by an open clubface – and conventional drivers are notoriously difficult to square up at impact. The GX-7 makes it easy. Add it up and you’ll enjoy notable improvement in your slice – without changing your swing. Q: What shots can I play with the GX-7? You might even find you can hit a draw with your GX-7. Q: Is the GX-7 legal under the rules of golf? A: Yes, indeed. The GX-7 is 100% conforming. Hopefully, our answers have allayed any concerns. Yes, the GX-7 is every bit as good as it sounds. You’ve been bombarded by Big Equipment’s marketing blitz for years (if not decades). You’ve watched the world’s top players use Big Equipment’s clubs to blast 350-yard drives and shred mammoth par 5s. You’ve read about Big Equipment’s technological innovations. And R&D budgets that would make the Pentagon blush. So yes – we get it. Remember what we told you right up front? That your approach to improvement is totally backward? That you should stop trying to change your swing to fit your driver? That you need equipment made for amateurs, not pros? Well, we stand by those statements. You should NOT pay $400 – $500 for a single golf club. The GX-7 is the BEST value in golf. Period. A new driver from Big Equipment costs $400 - $500. Upgrade to a custom shaft and you can add another $80 – $250. So you’re looking at a minimum of 400 bucks, perhaps as much as $750 (! ), for a driver that’s not even made for your swing. The GX-7 retails for $299. Put your faith in us and try one today, and we'll knock $100 off the price to reward you for taking a chance on something new. That makes the GX-7 just $199 (including headcover) when you try one today. Put another way: Buy the GX-7 today and your $199 investment is – at most – half what you’d shell out for a major maker’s latest driver. That’s what we call serious value. Your purchase is backed by an honest-to-goodness guarantee. Sure, you can return that $500 driver to the manufacturer if it fails to deliver as promised. But it better not show so much as a dimple mark on its fancy face. That’s right – hit a single shot with your brand-name club and it’s bye-bye, refund. You swing it, you bought it. If you buy from a retail shop you might get a 30-day guarantee, and they’ll take back clubs you’ve already hit. Of course, there’s a catch. Instead of cash, they’ll probably give you credit toward the purchase of another club. Call us old-fashioned, but we think you deserve some peace of mind when making such a major purchase. Try the GX-7 for 60 days and if it’s not the longest, straightest, easiest-to-hit, and most versatile club you’ve ever played, we’ll refund your money. How’s that for standing behind your product? Just send it back and we’ll refund what you paid (minus shipping & handling). Hit the GX-7 all you want for 60 days and if you're not happy, send it back for a refund. So go ahead and try a GX-7 X-Metal today. It's a no-risk, all-reward decision. Why can’t everything in golf be this easy? The way we see it, this decision is a no-brainer. ... there’s only one thing left to do: try a GX-7 today. Get started below now. SWING IT LIKE A 7-IRON. SMOKE IT LIKE A DRIVER. SAVE $100 + FREE Shipping to U.S. Addresses! Step 1: Do you need a right- or left-handed club? If you have a question about the GX-7 or if you’d like to order by phone, call our friendly customer service team at 888-529-6158 (Monday – Friday, 9:00 am-5:00pm CT). You can also send an email to [email protected]. Would you like to try the GX-7 X-metal for $1?